New Jersey native Tobin Heath is a U.S. women’s national team’s superstar, and a force of creative wizardry almost unequaled in all of American soccer - men’s or women’s. Tom Anderson first saw Tobin Heath play soccer when she was an 8-year-old trying out for his youth team in Somerset Hills, N.J. He sensed right away that Heath could be special. “She was quicker than everybody else out there at 8, and the other kids were 9, so we put her on the team," Anderson said. “She had the quickness which you can’t teach, and she had the intelligence that also goes with it." Anderson’s hunch proved right, and then some. Over 20 years later, Heath is now a U.S. women’s national team’s superstar, and a force of creative wizardry almost unequaled in all of American soccer — men’s or women’s. 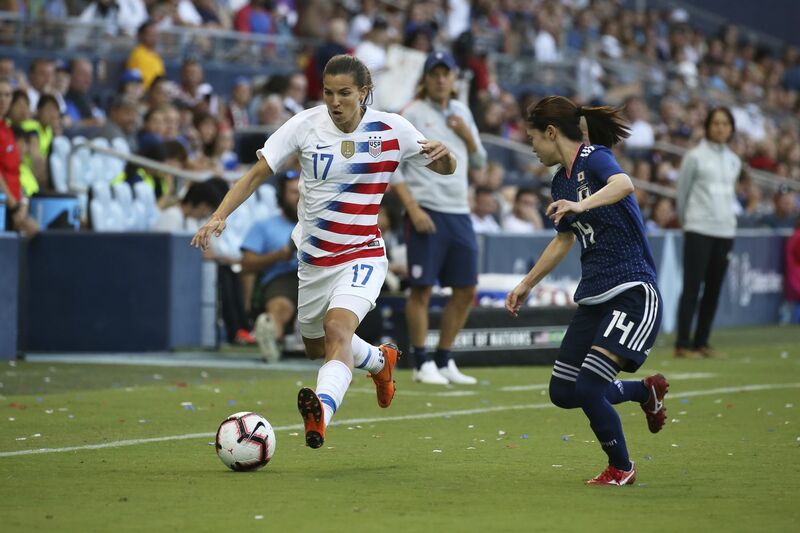 On Wednesday, the U.S. women will play their first home game of the year, against Japan at Talen Energy Stadium. In three-and-a-half months, they will play their first game at the World Cup in France. Heath arrives at this moment at the peak of her powers and skills. And if the Americans are to bring home a second straight World Cup title, she is likely to be a big reason why. Anderson has seen it coming for a long time. He coached her for a decade. When she and her under-13 team became too good for the competition, Anderson helped launched what became the New Jersey youth soccer powerhouse Players Development Academy to give the players a higher level of training. Michael O’Neill, director of PDA’s girls team coaching for 19 years, has known Heath since she was a teenager. Anson Dorrance recruited Heath to his North Carolina college soccer dynasty in 2006. His memories of her time there are still vivid. She never stopped nutmegging people, including Dorrance. He claimed that “of all the players I’ve coached, she’s nutmegged me more than probably all the rest of them put together.” But Heath also became a winner. The Tar Heels swept all four ACC titles in her time there, and lifted three national championships. She got her first senior national team call-up at age 18, and won her first cap at age 19. Heath has kept winning ever since. The 30-year-old now has two Olympic gold medals, a women’s World Cup title, and two NWSL championships with the Portland Thorns. And she still has a free spirit, uncorking those tricks and flicks and nutmegs on a regular basis. Every time she does, millions of fans swoon collectively on social media. “The reason people pay money to watch our game is for players like Tobin,” Dorrance said. “She’s a bit of a rebel in a positive sense, which I think is a part of what makes these creative mavericks unique." Even Thorns manager Mark Parsons can’t help swooning sometimes. “I mean, once a day, twice a day,” he answered. By the numbers, 2018 was the best year of Heath’s career. Even though she missed the first few months because of injury, she delivered eight goals and seven assists for the Thorns, and seven goals and six assists for the national team. Off the field, Heath has increasingly embraced the spotlight that comes with her stardom. She is not the national team’s most ebullient personality, at least not on camera. Her public persona, what fans see on television and social media, is often reserved. That’s not just a perception. It’s how she describes it. “I feel like, for myself personally, I’m more reserved as a person,” she said. “Having all this exposure and stuff like that in life is not comfortable for me. In a lot of ways, you kind of have to find comfort in that kind of uncomfortable setting, because you don’t really have a choice. But I think as much as you can control what’s inside of you, then the external factors don’t become such a big deal." But once she’s on the field, she unleashes everything she’s got — and often without having to think about it. When asked how many of her fancy moves are instinctive vs. planned, she didn’t hesitate.